Written by Dr. Anagha Kumar and medically reviewed by iCliniq medical review team. Skin, the largest and the most attractive organ of our body faces a lot of challenges during winters. Cold, dry winters tend to steal the moisture from your skin making it appear flaky, dry and dull. There are also a few diseases like psoriasis and atopic dermatitis that have an increased incidence in this season. Avoid excessive cleansing of your skin. Use soap/facewash not more than 2-3 times a day. Plain water can be used to cleanse whenever required. Pat dry your skin after washing it. Keeping your skin moisturized is the key to healthy looking skin in winters. Pick a moisturiser with SPF for mornings. Keep your lips happy and healthy with liberal application of lipbalm. Though its very tempting to have a hot water shower, it should be best avoided. Hot water tends to dry your skin. Use a body moisturizer within 3 minutes after your shower/bath. Do not ignore the sun! Cover your body to protect your skin from the cold dry winds and the sun. Application of almond/coconut oil all over the body (other than your face) 20 minutes before a shower would help it stay soft and supple. Skin is the mirror of internal organs, staying healthy is necessary to look healthy. Stay well hydrated and get adequate sleep. Include omega 3 fatty acids in your diet (especially beneficial in psoriasis), fruits, vegetables and nuts. Exercise increses blood circulation to your skin and keeps it healthy. Avoid smoking and alcohol- nicotine causes premature ageing and makes your skin appear dry and dull. Avoid using harsh astringents, alcohol based toners or peels on skin. Cream/oil based cosmetics keep your skin moisturized for longer hours. 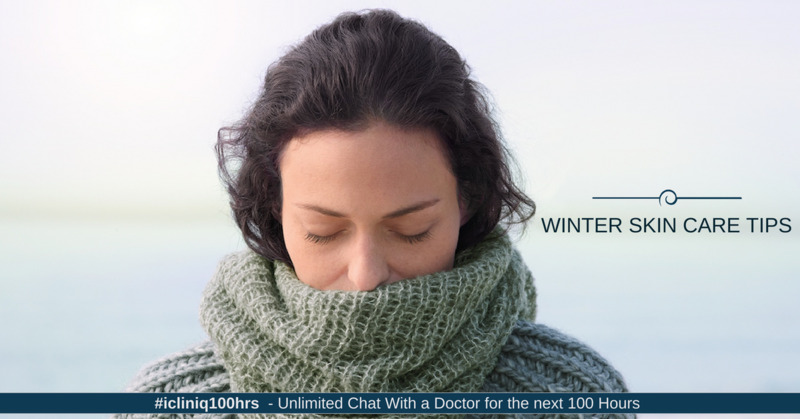 Winters can exacerbate a few skin problems and help must be sought immediately. Stay happy- it will show on your skin. Do you have a question on Skin Care or Psoriasis?